Be the first to share your favorite memory, photo or story of Lisa . This memorial page is dedicated for family, friends and future generations to celebrate the life of their loved one. Lisa Mae (Douglas) Tate, 69, of Temple, NH, died on January 19th, 2019, at the Merrimack Community Hospice House. 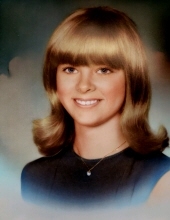 Lisa was born in Massachusetts on June 27, 1949, the daughter of Richard and Elizabeth Douglas. Lisa grew up in Amherst, NH, and graduated from Milford High School in Milford, NH. She was the beloved wife of Kelvin Tate, of Temple NH. Lisa was a professional mover for over 20 years and a waitress for over 40 years. She met her husband Kelvin while waitressing in Nashua. They were together 24 years and married for 12 of those years. Lisa enjoyed working and being with people. She loved animals, especially her beloved dog, Amos, aka “Brinny”, her four-legged Pit Bull “baby”. She is survived by her husband, Kelvin Tate, of Temple, NH; one daughter, Jennifer Cote and her husband, David; two granddaughters, Malissa Brockney and her husband, Byron, and Amanda Cote; a great-grandson, Thomas Brockney; three step-daughters, Jessica Taylor, Jillian Tate and Elizabeth Gabbard; and her brother, David Douglas. Family and friends are warmly invited to a memorial service to be held at the Congregational Church of Temple, NH, on Saturday, February 16, 2019, at 11:00am. A reception will follow in the Temple Town Hall, next door to the church. To send flowers or a remembrance gift to the family of Lisa Tate, please visit our Tribute Store. "Email Address" would like to share the life celebration of Lisa Tate. Click on the "link" to go to share a favorite memory or leave a condolence message for the family.